ARLINGTON, VA -- At 38 years old and a veteran of 968 games with five NHL teams, Mike Knuble knows that life after hockey is not far off. He's just in no rush to get there. "The longer I delay myself to getting to the real world, the better," Knuble said after practice Monday. Knuble took a step in that direction Monday with the Capitals announcing they have signed the free-agent-to-be to a one-year extension that will keep him in D.C. through the 2011-12 season. The deal is worth a reported $2 million. "I'll be 39 years old next year," Knuble said, "and I'll still have the chance to play this game and play in Washington and I'll always be thankful for that. It's something I wasn't ready to give up yet." And why would Knuble want to move on at this point? After recording just 3 goals and 8 points through Dec. 1, Knuble was one of the catalysts for the Caps' late-season climb atop the Eastern Conference. He closed out the regular season with nine goals and 13 points in 14 games, the Caps going 10-3-1 over that stretch. "It's a point in my life where you don't need to be out chasing things if you're in a good spot and you feel like you're with a team that has a chance to win all the time and contend, and that's a very important thing for you and your family to stay in that spot," he said. Knuble had 40 points in 79 games this season, and has appeared in 95 percent of his teams' games over the past four years. His 24 goals were third most on the Capitals, and part of Knuble's eighth straight 20-goal campaign. Not bad for a guy who never reached 20 goals in a season before turning 31. "He's like fine wine, I guess," coach Bruce Boudreau said. "He just keeps getting better, and the last half of the year he's been arguably our best player. If you look, I think his minutes have increased, year after year. Fatigue [is not a problem], he's in great shape, he's a consummate professional and we're a lucky group to have him for another year." Knuble's 24 goals are also third most among players aged 35 or older, trailing only Anaheim's Teemu Selanne and Tampa Bay's Martin St. Louis, who both finished with 31 goals this season. But unlike Selanne and St. Louis, who are known for their playmaking ability and highlight-reel goals, Knuble has stayed healthy and remained an effective top-line forward despite his blue-collar game and a knack for crashing the net and setting up in the high traffic areas. "He's the ultimate hockey player," Caps left winger Jason Chimera said. "He goes to the net and scores goals the right way, the ugly way." 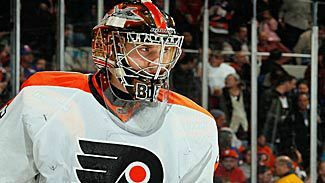 Knuble has also played with the Detroit Red Wings, New York Rangers, Boston Bruins and Philadelphia Flyers and is one of two players on this year's Caps roster with a Stanley Cup ring, having won one with the 1997-98 Red Wings. Jason Arnott has also won a Stanley Cup, with New Jersey in 2000. "He's certainly a good leader," Chimera said of his fellow alternate captain. "He talks a little bit off the ice, but he leads a lot on the ice. He plays as hard as he can every night and he's a guy you want with you when you go to the battles." Knuble missed only three games after taking a shot in the face and breaking his jaw in November, and despite never playing a full NHL season until he was 26, Knuble will begin next season 32 games shy of a personal milestone. "I'm most looking forward to playing in my 1,000th game," he said. "That would be a great moment next year and it's been my goal to get to that point for the last couple years." Knuble admits that he could have tested the open market July 1 and searched for a multi-year deal, but chose instead to give his family the security of knowing that they will be in the same place for at least one more year. "You get to a certain point in your life and things are not necessarily about dollars and cents all the time -- other things are very important to you and your family," Knuble said. "I was lucky enough to take advantage of that and still have some say in where I'm playing and where we live, where our kids go to school. I'm thrilled about it." Capitals note: The team announced Monday that it will open preseason play next season in Baltimore, MD. The Baltimore Hockey Classic will take place Sept. 20 with the Capitals taking on the Nashville Predators.